Photo courtesy of doug reeser. During the process of fieldwork, there is always present the innumerable conversations that have little or nothing to do with your actual research focus. Such conversations are an integral part of settling into your research community and building rapport with the people and places in which you are spending your time. During my first few months here in Belize, I have had many such discussions. For example, one day as I was walking to the center of town for lunch, I took a route that passed by the home and business of a couple with whom I hope to involve in my research. As I passed by, the wife of the couple yelled out a greeting, and waved me over. I had offered to help her with some work on local food recipes a few weeks earlier, and walked over to catch up. Her husband was nearby, working on a large wooden carving with a friend. He too called me over, and after talking with his wife for a few minutes, I joined him as he worked on the details of his carving. He handed me some sand paper to help with his work, and we began to chat about a variety of things ranging from art to politics. The concept of “power with” seems to be less theorized, but as my Belizean friends understand it, holding power is an inevitable part of international relations. However, power does not need to be exercised over others. Instead, power can be used to build relationships, and mobilize resources based on partnerships and the public good. Here in Belize, the U.S. is seen as a world power that currently exercises its power in the interests of the few – primarily the wealthy classes. There exists in peoples’ minds, however, a different U.S. – one that at some time in our history has acted with beneficence. It can be argued that the actions of world powers in the international arena have always been in the interest of those that hold that power. Still, people that do not hold the reigns of power can envision a different possibility, although the three of us did have difficulty figuring out what it would take to bring about such changes. Interestingly, when I returned home later that day, I stumbled upon an article published in The New York Times, “Thirst for Fairness May Have Helped Us Survive” (by Natalie Angier, July 4, 2011). The article touches on a variety of research – including such diverse topics as primate studies, human evolution, research with contemporary tribal groups, and even brain scanning studies – all around the idea that humans have developed with strong leanings toward egalitarianism and fairness. In other words, our social norm as a species may be based on equality, trust and mutualism. The article notes: “Low hierarchy does not mean no hierarchy. Through ethnographic and cross-cultural studies, researchers have concluded that the basic template for human social groups is moderately but not unerringly egalitarian. 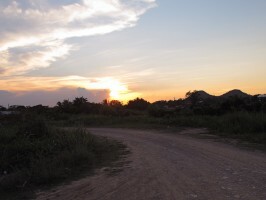 They have found gradients of wealth and power among even the most nomadic groups, but such gradients tend to be mild.” The yearning for a less hierarchical society persists, and is evident among my informants in Belize, and perhaps more so in the many parts of the world where protests against the world order are thriving. What I find especially interesting about these two events – a talk with two Belizeans about a country’s potential for good and the almost simultaneous discovery of an article on the human propensity for fairness – is that they got at similar concepts in staggeringly different contexts. Such connections while in the field are not entirely uncommon, and they are part of what makes fieldwork so exciting. The potential for working together, for creating a more fair and just world, and for connecting with other human beings is alive and well. Hope remains. This piece also appeared in October 2011 in the column, Notes from the Field, in the American Anthropological Association's Anthropology News. Amazing thing is that you would never have a conversation like this in the states, it would be looked at as treasonous. The truth is, this country seems to be at a point now (or in the past few years) where the decisions being made can really make us good or hasten the inevitable downfall. Tender - In many cases, I think you're right about this conversation in the US, although there are a number of people that would hold similar views, as the occupy protests would seem to indicate. What was fun about this conversation in Belize was that it was not really political in the sense of conservative-vs-liberal stances. We were just talking about the potential of power. Envisioning the positive use of US power, and hoping that we can all move forward into a more just world. I think we could have just as easily gone the other way towards discussions of a continued downward spiral. None of us wanted to go that way though!